Miss Pepsi, the fastest hydroplane in the Detroit River in its time, was perhaps the most famous symbol of a family that made their livelihood distributing nationally famous soft drinks to Detroiters and residents of the region. The company was Dossin’s Food Products. This is a story of three brothers, Russell, Walter and Roy Dossin, and their love for speedboat racing. Since 1898 when their father started the business, the family produced and distributed the Dossin brand of food products and soft drinks throughout metropolitan Detroit. In time, they became the bottler of Pepsi-Cola for the state of Michigan and northern Ohio. By controlling the sale of a product this popular, Dossin Food Products prospered. But the Dossin brothers saw an opportunity to increase sales further and have fun doing it at the same time. In the 1920s, Detroit became the automotive capital of the world. As a result, many people living here had a great knowledge of engines. Engines powered cars and also airplanes and boats. Speed boating became popular and of course the owners had to have races to see who had the fastest boat. Those races evolved into organized events that attracted public interest wherever they raced. By the late 1940s, the Dossin brothers had become interested in speedboats and they began naming their boats after their most successful product, Pepsi. In 1946, they commissioned the first boat named Pepsi-Cola III. It raced in only one race in Washington D.C. The next year, the Dossin brothers bought an older hydroplane and wanted to fit it with a bigger engine. World War II had just ended, and so there were a lot of surplus airplanes and airplane engines. They bought twenty-five of the engines and had one installed in the boat. The engine made the boat very fast but it was huge. It was so big that the driver’s cockpit had to be removed and rebuilt to hang from the back of the boat. That made for a very rough ride – but speed, not comfort was the main objective. They called the new boat Miss Peps V and hired Danny Foster to race it. Like the engine itself, Danny Foster was also a product of World War II where he had been a fighter pilot. That first year, 1947, Miss Peps V was the season champion, winning seven out of eight races including the American Power Boating Association’s Gold Cup. The Gold Cup is America’s most prestigious racing trophy and it has been in existence since 1904 – seven years longer than the famous Indianapolis 500 car race. The boat racing was so successful and enjoyable in 1947 that in 1948 the Dossins had a new, even faster boat built. This was the first Miss Pepsi, and unfortunately it turned out to be rather sluggish. Then an unfortunate accident turned into something good. At a race site a crane dropped Miss Pepsi while moving her. If the Dossins were going to continue to compete, they needed a new boat. This time, they went for the very best. They hired an exceptional boat designer named John Hacker, and Les Staudacher’s company – the finest – to build the new Miss Pepsi. 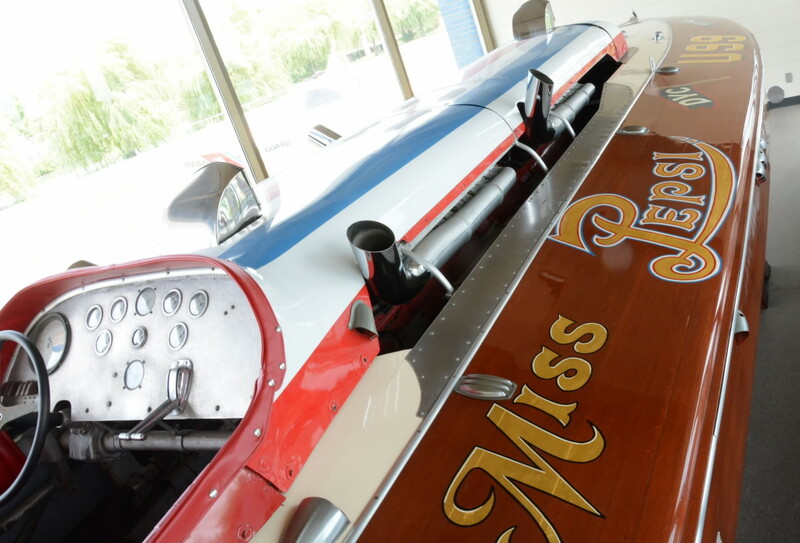 Chuck Thompson, the champion outboard racer that had driven the first Miss Pepsi for the Dossins in 1948 and 1949 was chosen as the driver of the new Miss Pepsi. With two airplane engines, and Chuck Thompson in the driver’s seat, the new Miss Pepsi set speed records and won numerous races over the next two years, something no boat or owner had ever done before! It seemed nearly impossible for anyone to beat this new, super-fast boat. It seemed so impossible that Miss Pepsi was withdrawn from racing. After all, where was the fun of racing if there was no longer a challenger? Withdrawn from racing, Miss Pepsi moved to the new museum on Belle Isle, a museum the Dossin family largely supported. In 2001, Russell, Walter, and Roy Dossin, and Russell’s son, Ernie, were inducted into the Unlimited Hydroplane Hall of Fame for their contributions to the sport of hydroplane racing. Now the Miss Pepsi is a teaching tool. It not only helps to tell the story of speedboat racing in Detroit, but it also tells the story of Detroiter’s skills with engines, and a story of doing what you love – and doing it well.